Like the sweet music of a love song, Windswept Bay has a magic of its own and on moonlight nights and sun bronzed days love is in the air. The Windswept boxed set includes books 1-5 PLUS as an added bonus, book 6. This series will sweep you away and leave your heart thumping with the satisfaction of pure heartwarming romance. 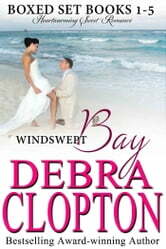 Can a famous sea life artist with survivor’s guilt and a resort owner find love on the shores of Windswept Bay? Sought-after sea life artist Grant Ellington is suffering from survivor’s guilt nearly a year after being the only one to live in a private plane crash. As a favor for a friend he heads to Windswept Bay to try to paint a sea life mural at the resort. One meeting with the beautiful Cali Sinclair and he feels alive again. But, like him, Cali has her own emotional scars—can they learn to trust the love that sparks between them and move forward from this moment on? Gage Lancaster is a self-made millionaire used to getting what he wants, but lately there’s an emptiness and a restlessness to his life that he can’t seem to fill. While visiting Windswept Bay, he spies a beautiful woman on the beach, struggling to rescue a sea turtle tangled in fishing line, and goes to help. Gage is captivated by the fire and passion that radiates from Shar and he is drawn to her instantly. But this may be one time when what he wants might not be an option. 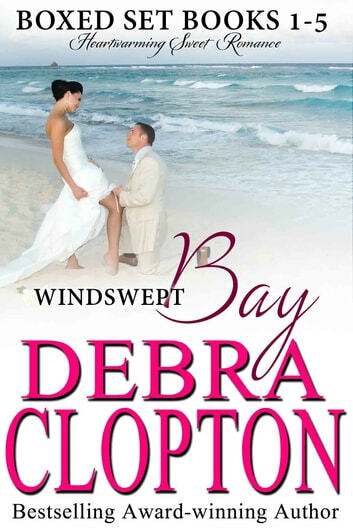 On the sunset beach and sparkling blue waters of the romantic Windswept Bay, can Gage and Shar find love? Publicist Olivia Sinclair has been away from Windswept Bay for years, busy helping the Hollywood elite get out of one scandal after another. But now, she’s in the middle of her own scandal and splashed all over the gossip tabloids. Suddenly, coming home to lay low in Windswept Bay is her own best advice to herself. Life as he knows it has just been altered for charter boat captain, Brandon “BJ” McCall. He’s just learned he has a brother and he’s inherited millions—complicated…just a little and he’s not exactly sure how he feels about either. But rescuing an intriguing female from the roof of her house is a complication he can enjoy. Jillian Sinclair needs a man and she needs him now. She dreams of being a mother-but the doctor just gave her the news that if she plans to carry a baby herself then her time is running out. She also wants true love like her sisters but will she have to settle for something less than that in order to get her baby? The last thing she needs is undercover cop, Ryan Locke, the only man she's loved and lost, coming back to town. Can he be the answer to her prayers or will his dedication to justice take him away from her once more? After her small son, Kevin, asked both God and Santa for a new daddy for Christmas, and then didn’t find him under the tree, school teacher, Jessica Lyons is starting the new year out with a very unhappy six year old on her hands. Kevin can’t understand that she’s only been a widow for 2 years and she can’t imagine marrying again—not yet at least. But, unknown to her Kevin has a plan and has decided that if God and Santa won’t give him what he wants then maybe the police can ~ Chief of Police Levi Sinclair is about to meet his match at show-n-tell. Fun series with touching stories for all 4 sisters and the appetiser of Levi's story thrown in as a bonus. Can't wait to read the other 4 brothers stories. I couldn't put the books down, I love the stories and some parts make you laugh and other part make you teary eyes. Will definitely seek to buy more of her books. I could read her on and on. I didn't find any parts of the 5 books that was boring!!! !